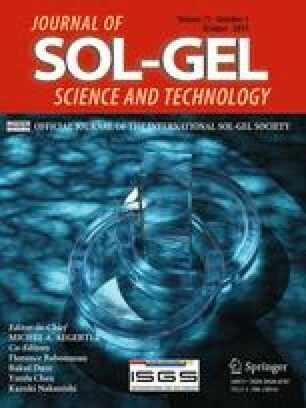 The current paper presents a novel Pb(II) ion-imprinted silica-supported organic–inorganic hybrid sorbent functionalized with Schiff base by coupling a surface imprinting technique with a sol–gel process for the selective removal of Pb(II) ions from aqueous solution. Fourier transmission infrared spectroscopy, scanning electron microscopy, N2 adsorption–desorption isotherms and thermogravimetric analysis were used to characterize the Pb(II)-imprinted hybrid sorbent. The adsorption equilibrium was finished with 30 min. The experiment value of maximum adsorption capacity was found to be 54.9 mg g−1. There were not significantly influence on the adsorption capacity of Pb(II) in the range of pH 3.5–6.5. The equilibrium data were fitted very well to the Langmuir isotherm model and pseudo-first-order kinetics model. Under competitive adsorption conditions, the Pb(II)-imprinted hybrid sorbent was 3.09, 4.73, 3.34 and 4.96 times more selective than the corresponding non-imprinted sorbent for the systems of Pb(II)/Cu(II), Pb(II)/Cd(II), Pb(II)/Ni(II) and Pb(II)/Zn(II), respectively. The thermodynamic results demonstrated that the adsorption of Pb(II) onto the Pb(II)-imprinted hybrid sorbent took place by a spontaneous and endothermic process with further increase in the degree of freedom at the solid–solution interface. The project was sponsored by the National Natural Science Foundation for Young Scientists of China (Grant No. 21107076), by program for Liaoning Excellent Talents in University of China (Grant No. LJQ2012032), and by Public Welfare Scientific Research Project of Liaoning Province of China (Grant No. 2012003003).